in Creative & Tech with tags Amazon's Alexa, Andrew Jarecki, Artificial Intelligence, Google's A.I. AlphaGo, Internet of Things, JJ Abrams, KnowMe, robotics, Robots, sxsw Both comments and trackbacks are closed. Our SXSW ambassadors have returned from Austin creatively recharged and ready to share their experiences and learnings from the 2016 SXSW Interactive festival. The below post is a first-person account from one of our brand ambassadors, Katya Kotlyar, Strategist at 360i. 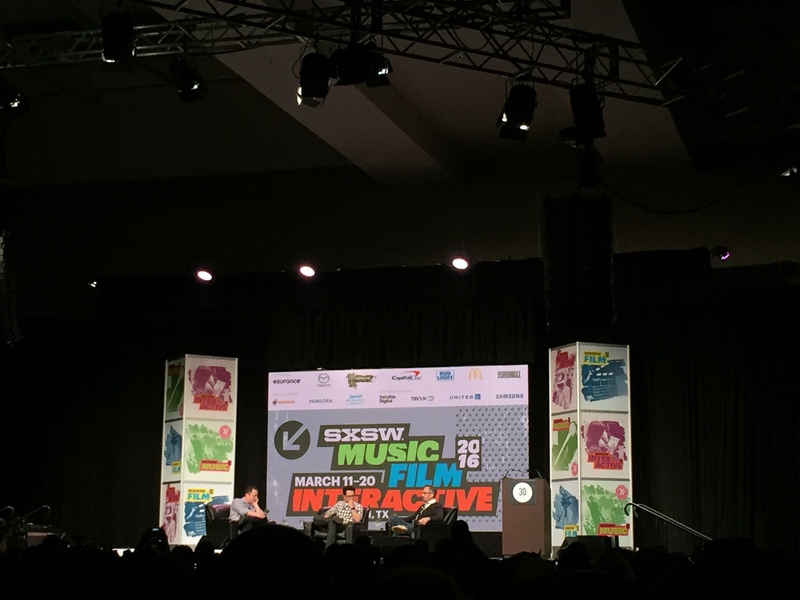 In this post Katya shares a few takeaways from the SXSW panels she attended which focused on robotics and artificial intelligence (A.I.). It’s no secret that SXSW is the overstimulation central where you truly start wishing scientists would have invented a way to be in several places at the same time already. While I found many panels to be very interesting and informative, it proved pretty difficult to spot the ones that would have guaranteed an hour well-spent with valuable observations and eye-opening discoveries. So, I decided to take a slightly different approach to SXSW and attend panels that did not directly relate to my day-to-day work to broaden my horizon and become inspired by something completely new and different. Plus, in my life experience, things which at first might not seem even remotely related to work, can often turn out to be extremely insightful and relevant in unexpected ways. One of the panelists made the experience quite unforgettable. Sophia, an artificially intelligent robot, took questions from the panelists and shared her existential musings on being a robot and aspiring to have real friends. Sophia is not ready to go out and make actual friends just yet, but products like Amazon’s Alexa are already becoming quite popular and a big part of many consumers’ daily lives. Overall, Alexa and Amazon’s success was mentioned a lot in various A.I. and Internet of Things panels as an indicator of a serious step forward to the adoption of voice interaction with the basic machines. One particularly interesting part of the discussion touched on less obvious applications of A.I. robots (e.g. in situations such as providing therapy), as well as the recently debated topic on the future of the workspace, and robots replacing jobs. And meanwhile, while I was in Austin, Google’s A.I. AlphaGo was beating the world champion Lee Se-dol 4-1 in South Korea. After standing (well, mostly sitting) in line for more than an hour, I earned my seat in “The Eyes of Robots and Murderers” session to hear JJ Abrams and Andrew Jarecki share their perspectives on storytelling, creative process and the interaction of creativity and technology. Celebrity status aside, I’ve always found JJ Abrams and Andrew Jarecki to be very prolific, multi-talented and highly productive creators. And this session – being both inspiring and reassuring – reinforced my opinion. Technology Enables, but Great Storytelling Remains Key: No matter how great the computer generated imagery (CGI) is, or if the video has the best Virtual Reality (VR) tech behind it, a story that doesn’t pull viewers in will leave no trace in their memory. Tip to marketers: before diving into the ocean of the latest tech trends, make sure to invest time and effort into crafting the story for your consumers. Small Screens Work: Driving the above point on storytelling home, JJ Abrams explained why small screens work for him, explaining how while we may want everything ideally to be viewed on a high-quality big screen, formats don’t matter as much as the story. Make the story simple and something viewers can truly relate to on a deeply emotional level. Technology Continues to Open Doors for Easier Content Creation: During the panel, Jarecki demoed his new app KnowMe which lets users easily compile creative stories from content shot on the fly and from their Camera Rolls. It’s easy to navigate and users have options to stitch different media together, add voiceover and share the results on social platforms like Facebook and Twitter. As a product made by some of the most successful storytellers (it’s backed by JJ Abrams), this app aims at providing a tool to plot and create a more comprehensive story as opposed to quick “in the moment” content. As KnowMe just launched, it’s too soon to make any conclusions on the adoption of the app, but I for one will definitely be trying it out and keeping track of its progress. For more on 360i at SXSW 2016, check out #SX360i on Twitter, and read the additional SXSW content being posted by ambassadors on the 360i blog this week.